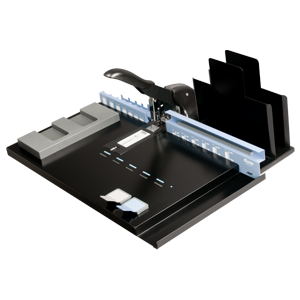 The BooXTer Zero Max™ is a compact workstation compatible with the most commonly made books (presentations, yearbooks, manuals, etc), from miniature to SRA3+ up to 20 mm (0.78") thick. 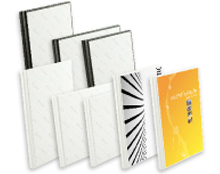 You can make printed hard and soft covered books, strip-back books, and more. The BooXTer Zero Max system will bind the largest amount of pages in the BooXTer family. It includes a professional heavy duty stapler - rugged yet lightweight. The table is designed with built in book block spacing system to make the placement of the book block in the cover perfect every time! 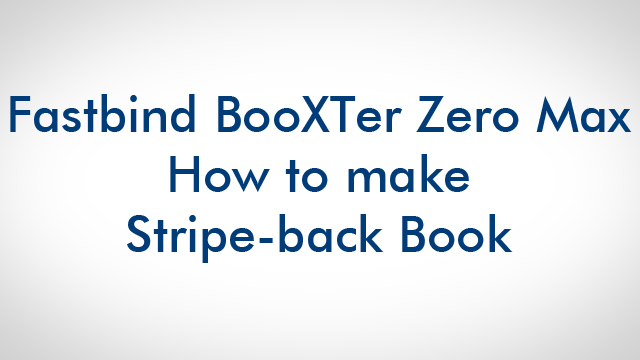 You can create an elegant strip-back book using the automated Fastbind Zero Max. Place your content on the BooXter, against the back guide. Place a BooXTer stripe on the front, with the foamy grey area towards the spine, as shown in the clip. Staple your book starting at the center. The book is stapled properly, with a smooth surface and no staple sticking out. Then, you just peel off the stripe and fold it over to cover the staples. You outstanding book is ready and secure! Fastbind BooXTer stripes are available in A4 portrait, A4 landscape and A3 portrait.